Ready for an amazing adventure that sends you soaring through the West Virginia mountains? Than a zipline tour is exactly what you need. Luckily the North Fork Valley Canopy Tour is close by and ready to give you the thrilling ride you need. 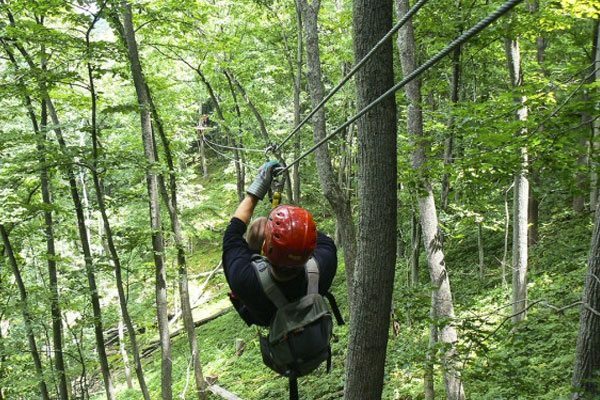 The North Fork Valley Canopy Tour is modeled after canopy tours found throughout Central America and the Caribbean. While there is a certain level of thrill involved, the 3.5-hour experience is designed to give participants ample exposure to the natural features of the North Fork Valley and to allow participants the time to appreciate these surroundings. It is not a high speed thrill ride nor is it a short-lived, add-on to a stay at a resort. The NFV Canopy Tour is a 3.5-hour, guided experience that allows you to explore Pendleton County in a completely new way.